I don’t know about you, but I love getting out of the classroom. 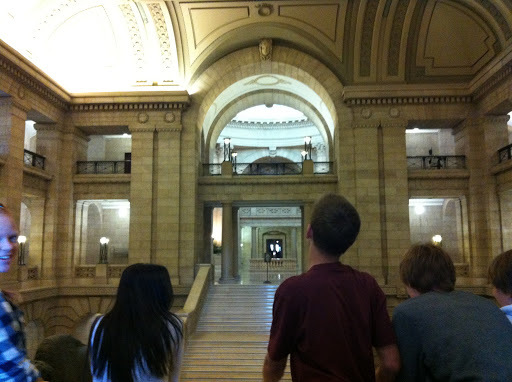 As much as possible, I like to take students to archives, conferences, legislative buildings, museums, and even on walks around the neighborhood. Sometimes “place” can be the curriculum. I love getting out so much, that I suspect I annoy colleagues who are trying to plan assessment tools and wrap things up at the end of a term. For this, I apologize – sort of. Place is just one resource that many teachers use as a means for making the learning experiences educative, meaningful, and transformative for students. Many teachers use authentic and global events to direct the learning that goes on in their learning communities. Others collect real-life resources through guest speakers – an easier feat given new technologies and a shrinking world. There are still amazing history teachers who I adore who use their stories and storytelling abilities to make learning about imagination, empathy, and progress. Desmond Morton graces us a few times a year, and we could listen to him all day. What all these strategies come down to is the idea of teachers collecting their own resources to make the teaching and learning process as exciting and engaging as possible. Two recent events started me down this path of how it is we create resources for and with our students. The first was an article printed in the Winnipeg Free Press entitled Human Rights Lessons not Easy. In this article, it was revealed that almost 50% of teachers across Canada do not feel that they have the resources to teach about human rights. Immediately, I had a few issues with these findings. The most alarming was that there are teachers out there who feel that their schools, divisions, and provinces should be creating resources for them on any given topic. Part of being a professional is doing research, not only on teaching and learning, but on what you are supposed to be teaching. In the case of human rights,this might involve going to a library and reading a book, looking at Aljazeera, or as my teacher-friend Marc Kuly said, “driving through Winnipeg with a video camera.” Isn’t the onus on teachers to know, deeply, about our subject areas? This practice, for me, involves getting rid of my cable, not watching the NFL or the Bachelorette, using Spring Break for study and not Vegas and actually participating in discussions related to the fields that I teach. The excuse of “not enough time” is played out. Make time. The second event which was a catalyst for this reflection about resources was the release of the viral video which involves a student in Texas telling his teacher that simply putting packets of worksheets together is not teaching. His outburst is a cris-de-coeur and clearly he is an engaged learner who is frustrated by mediocre teaching. My heart broke for this kid, Jeff Bliss, because we have all been there. My Grade 11 Canadian History class in 1993 was not much different – I just wish I had the gumption to challenge teachers whose notion of teaching was slapping together random “resources.” The student in the video demands excellence from this teacher and this excellence comes down to sound pedagogy, subject matter knowledge, passion, and a joy with connecting with young people through the curriculum. all of these elements are resources which we must think deeply about. As teachers, we need to strive for excellence, even though on most most days, I know for myself, we shall short. Part of this journey, however, depends on research, thinking, and hard work in order to amass resources, tools, and ideas that engage students in the learning process and the joy of knowledge we are creating and contributing to.